Jerusalem’s highest penthouse with the best views. In the last 10 years the Jerusalem city center has become the best location for real estate investment. Today you can find more new construction in the city center than in any other neighborhood in the city. More and more new luxury buildings are being built every year and more are in the planning process. The center of Jerusalem is going through a renaissance, renewal and revival unrecalled in the history of the city. In a small street between the Leonardo Hotel and Hillel Street, there is a luxurious building with 24/7 doorman, impressive spacious lobby and private pool, spa, gym, and garden for the private use of the building’s residents. We are offering the jewel in the crown – the 18th floor penthouse on the tower’s top level. Beautiful, high end, and renovated to the highest standard with a smart-house system, on 3 levels with a private internal elevator. The penthouse is being offered fully furnished with exclusive designer furniture and top brand appliances. The entrance of the penthouse is a beautiful glass staircase, which runs besides a high-ceilinged window leading to the main level – an open plan large living room and dining room area. The living room has a large lounge area, with a flat screen TV and a projector for the option of turning the area into a home cinema. The dining room is surrounded by large windows looking out on to the Jerusalem center view and beyond. 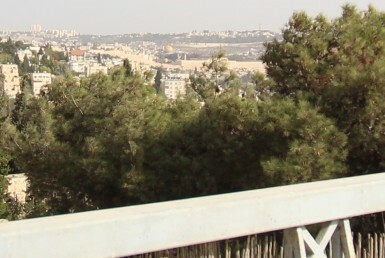 The large succah balcony has a panoramic 3 directional view including the Old City walls, the Temple Mount , Independence Park, the King David Hotel and the Talbieh neighborhood. In addition it comes with a modern chef’s kitchen with separate sinks and all top brand appliances. The bedroom level has 3 en-suite bedrooms, plus a huge master suite with surrounding windows in 3 directions with breathtaking views, a walk in closet and a superb private bathroom. On The top floor there is an exquisitely designed office/family room which leads onto a spacious roof terrace with an outdoor hot tub and a rare panoramic view of Jerusalem. living room level – 116.66 sqm Plus 28.42 sqm open balcony.